Use for decor or to deter geese. A White Swan Decoy has proven to effectively ward off Canada Geese from your pond or property because they are know to fight for their territory. Buy 2 or more and save money! The White Swan is a perfect addition. Use for decor or to deter Canada Geese more economically and without all the costs, hazards, and time required when spraying repellents. White Swans are very territorial, making it great to help keep geese away! In nature, Mute swans aggressively protect their young from Canada Geese, making this swan an effective deterrent as part of an overall repellent strategy. Head and neck can be adjusted for a realistic look. This plastic decoy may be free floated, or secured in the water with string or decoy weights. It may also be secured on shore with two steel anchoring stakes (included). Decoy should be moved periodically to increase effectiveness and used with other deterrent methods. 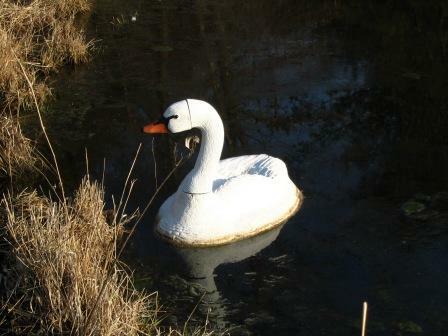 Our White Swan Decoy will help deter Canada Geese from landing in your pond or water garden. In nature, White Swans are very territorial and will fight off most intruders who venture into their area. Geese will not want to confront an angry White Swan and most times will choose another body of water to land in. 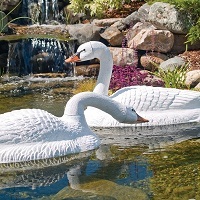 This beautiful, hand painted floating swan is the perfect addition to any pond or backyard setting. Made from durable, lightweight polymer, this swan is decorated with all weather and non-fading paint to withstand different types of climates. Most customers have had great sucess with using the swan decoys in repelling Canada Geese but there have also been several northern customers who have had no luck in detering the geese. The swan decoys are just another weapon in your arsonal of Canada Geese Control. If nothing else, these decoys do make a nice addition to any body of water. Customers have called and asked if we guarentee the swan decoys will work. I tell them most customers have had great sucess, but there is no guarentee, written nor implied. Folks, we are talking about nature. Anything can happen! The good news is you will have a realistic looking white mute swan floating happily on your pond or lake. That alone is worth the price! Customer's have also reported increased control by letting the first 3'-6' of the vegetation around the pond grow to a mature height. Canada Geese do not like crossing through this vegetative buffer because it is where many of their natural preditors will lay and wait to kill the geese. The buffer will help stop the daily trips from the water to your lawn and back again. With the addition of decoys, you should be able to convince the Geese to fly off to another location that is more inviting. You can also try our coyote decoy (see related products below) to keep off your lawn. See video below for more creative suggestions. Sold Individually but price drops with quanity purchases. Customer's report a pair of decoys works better than an individual decoy because it simulates a mated pair (Male and female). Since in the wild swans mate for life, in a mated pair, the male would fiercely defend his territory and want to protect his mate (& off-spring). Adjustable Movable Head & Neck (see Main Photo on top right of 2 possible positions). To make the swan's head in the lower position, you would remove the neck and head and re-connect it in the reverse direction with the short curved portion now connected to the body and the head attached to the opposit end of the neck. Takes less than 10 seconds to make the change with the twist and insert molded ends of the neck & head. Floating swan is full sized and very life like. Decoy is a shell only. Body is hollow, not solid. Great for wedding locations or wedding photographers who want realistic swans (they can control) in the background shots. Note: Due to the large size of this decoy, the box it ships in is a 36" x 19" x 9" box & it must ship as OVERSIZED (or 37 lbs dim weight.) The listed shipping charges reflect the actual cost to ship this large of a box through the carrier. PS. If you do not tether the swan decoy, make sure to move it around so the Canada Geese think it is real. This will increase effectiveness. If it is left in the same location, the geese will quickly figure out the decoy is fake and will not be afraid of it. Great for use with other deterrent methods like the Coyote and allowing the first 2' of growth next to the pond to be allowed to grow tall and wild. 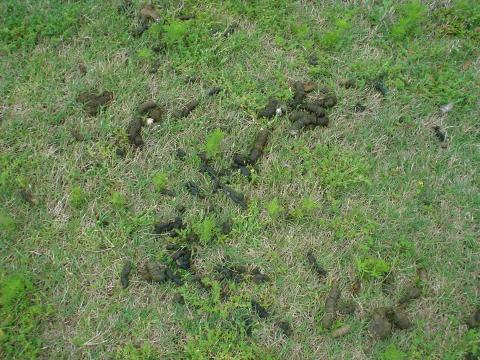 This will help keep the geese off your lawn. We have had feedback from many customers that the Alligator Decoys (sold below in Related Products) also help in detering Canada Geese from small to medium ponds along with the Swan Decoys. From Anonymous of York, Maine on 4/20/2018 . From RHODA SINGER of TORONTO, Ontario on 8/3/2017 . From Anonymous of Deer Park, Illinois on 5/5/2017 . From Anonymous of Oxford, Michigan on 7/8/2016 . Keeping the geese away! Yeah! From Anonymous of Hartland, Wisconsin on 6/27/2016 . 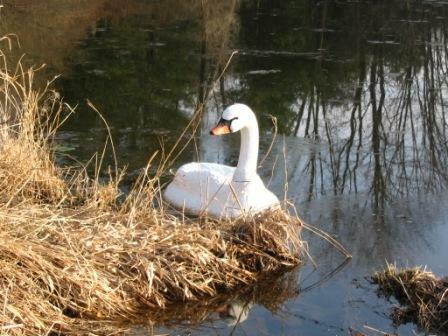 5/13/2014 – We have 4 swans in our pond and when it gets a little windy one or two of them turn over. If you have any suggestion on how . . .
4/6/2014 – How do you rig them so the wind will not blow them over. We have two old decoys, and they seem to work, but as they got . . .
2/18/2013 – Do you only use a pair of the swan decoys or can you use more?? 8/22/2012 – Do you have the one with the long crooked neck that appears to be eating something off of or out of the water? Coyote Decoy - Flambeau Master Series Lone Howler with Fur Tail for Hunting & Canada Geese Control – Place this on the shore to keep Canada Geese off the lawn!